foto realizzata a mano libera. The pattern draws the eye to the top left. Very interesting shot. see you at the front page ;-) Congrats on the well deserver POD! I can only quote myself "This one combines the black & white floor texture with the colorful motion blurred boy. very good composing, congrats!" Congratulations for Picture of the Day Federico. This one is really cool. Well done!! Grande occhio e capacità compositiva giustamente riconosciuti, complimenti Federico!!! .. è sconcertante.. vedo il mio voto ma non vedo piu' il mio commento.. felice di rivedere questa perla.. di semplicità e di effetto! Congrats for first page - POD!!! Non mi aspettavo questo riconoscimento, sono contento di pagarvi da bere! Domani a pranzo?? Oggi ho avuto una bella sorpresa trovando questo premio, il mio primo. Inaspettato! Grazie per il tuo apprezzamento! Great thirds, the slight tilt makes for an interesting perpective to the composition. Well taken & seen Federico, regards. Beautiful composition... I love the perspective... Very well presented... Congratulations!!!! Te l'avevo detto che era ottima! E'un piacere vederti in home page con questa tua ottima fotografia. ed eccolo il primo award...ora devi pagare da bere,champagne s'intende e del migliore!!!! 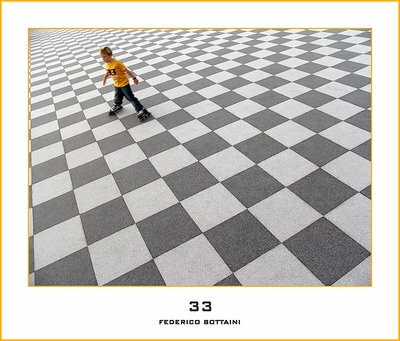 Very well done as perspective and wide view Federico Bottaini. framing is creative and enhance the feeling! thanks a lot, has made much pleasure your comment me. Splendid picture. Perfect positioning of the figure with its sense of movement and bright, attractive colours, in strong contrast with the monochrome pattern of tiles stretching away to the distance in every direction. I love the sense that the skater is skating DOWN the a slope (although I realise it is probably an optical illusion created by clever cropping). Quel pavimento e' fantastico, mi sembra di vedere quelle immagini di Escher, molto bella e ben realizzata. La cornice mi sembra sia un po' troppo forte rompe l'equilibrio e attira molto l'occhio, naturalmente e' una considerazione del tutto personale. You use this paving to great effect, in this image and in several others. I love the way the colour of the skater stands out against the grey and white of the paving. E grazie per avermi aggiunto nei tui friends. Io non posso ma ti tengo d'occhio non ti preoccupare. Ottimo lavoro alla terrazza Mascagni. Very eye pleasing lines and shapes. I love everything about this work of art! Thank you, Federico, for your kind words on my image...I appeciate it so much! wow...meno male che hai avuto la pazienza di aspettare! una grande foto! you have a great portfolio, if I may start with this general impression. This one combines the black & white floor texture with the colorful motion blurred boy. very good composing, congrats! Excellent work! I like it very much! A beautiful gliding, sliding, hoovering feel. The magic works, really. Good shot from a graet location. One commentator has suggested that freezing the skater might make a better capture. I agree. But a long exposure in which the skater is a blur might also make an effective shot. Wonderful capture. The boy at the top corner in colour with the ground in neutral and the unusual angle really works well. ottima per colpo d'occhio e collocazione. grazie per il commento, voglio solo precisare che può sembrare una foto con il soggetto a colori e il resto in bn, ma la foto è tutta a colori. Ho soltanto aggiustato l'esposizione successivamente in ps. una propsettiva da capogiro ottima direi come la presentazione! Questa terrazza è uno scenario perfetto ! Lo sfono a scacchi bianco nero contrasta magnificamente con il rafazzion vivacemente colorato, il tutto esaltat dall perfetto taglio dell'immagine. Molto bella Fede, anche questa come l'altra della bici ti ha visto arrampicato sulla balaustra, come un falco su un ramo in attesa della preda! Molto piacevole anche la grafica di presentazione. Nice coloured, compo and cute little boy! Brilliant, I really enjoy looking at photographs taken at this place, the black and white slabs are excellent and your composition is great as usual! The lines are excellent. Such an intriguing pattern! The angle was very well thought, as I can see that a thin line of checker box pattern was left intentionally on the left side of the picture, and on careful inspection, the line actually got thinner, together with the checker box pattern that got smaller. The pattern and the lines are very well angled that it diminished at upper left end of the picture. That's why I said it is such an triguing picture. By the way, as Mirek Towski pointed out, too bad that the skater was not frozen in motion, or else it would make perfect picture. this is a stunning composition.. great way of coloring as well.. WOW!!!!!! This is excellent Federico!!! !What a great perspective and illusion!!! The photo does not look rectangular but I know it is!!! very good. likes a advertisement photo. thank's very much for comment! I will go to see tui the jobs! you have one beautiful collection. Great DOF perspective with out any distortion! Thank's very much for comments. Good concept, if the skater was "frozen" in motion it would even be better. Great location!